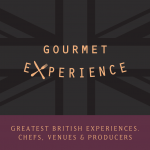 Ben Prior fell into catering by chance, while working part-time in an award-winning restaurant earning money to pursue a golfing career. Spending time as a kitchen porter at the highly-regarded Le Talbooth, in Dedham, Essex, Ben developed an interest in cooking through working alongside people with a passion for fine food and decided he wanted a part of that. With 20 years’ catering experience since he left school, Ben has no official training but has learnt all he knows through working his way up from porter to waiter to bar staff and eventually into the hub of the kitchen during his seven years at Le Talbooth. After moving around the country, then spending a year travelling, Ben decided to settle in Cornwall. 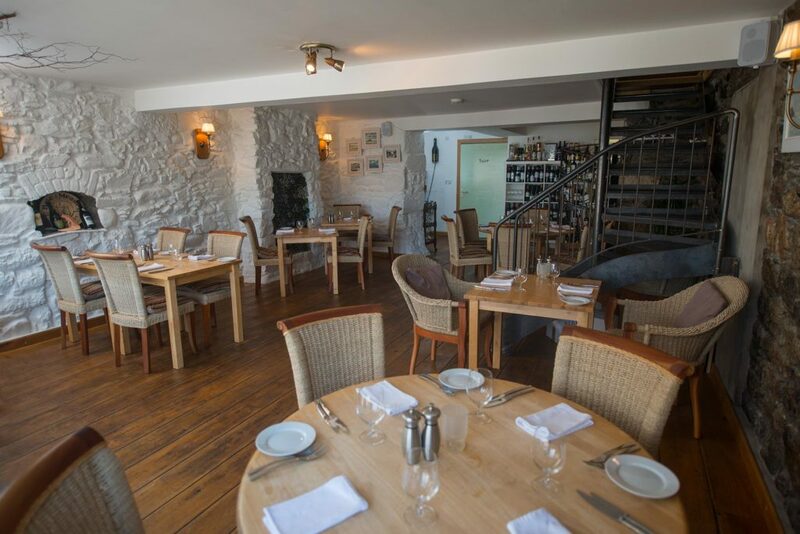 Cornwall has a strong family connection – Ben’s grandfather owned a hotel in Cornwall and it was a favourite summer holiday destination. Ben also loved the fresh produce served up in the seaside county. 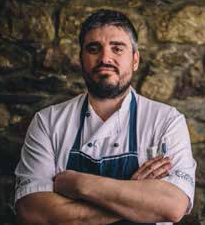 Ben is now owner and head chef at Ben’s Cornish Kitchen, near Penzance, where he works alongside his sous chef brother Toby, and mother Jayne. His family restaurant offers a small but perfectly formed menu that has won the restaurant several awards including: 2 AA rosettes, South West Restaurant of the Year in the Waitrose Good Food Guide 2016, The Trencherman’s Guide best restaurant 2016, and was named in The Times Top 100 restaurants 2017. Creative dishes made with seasonal, locally sourced produce in a pared-back setting on 2 floors. By chef Ben Prior of ben’s Cornish kitchen, Cornwall. 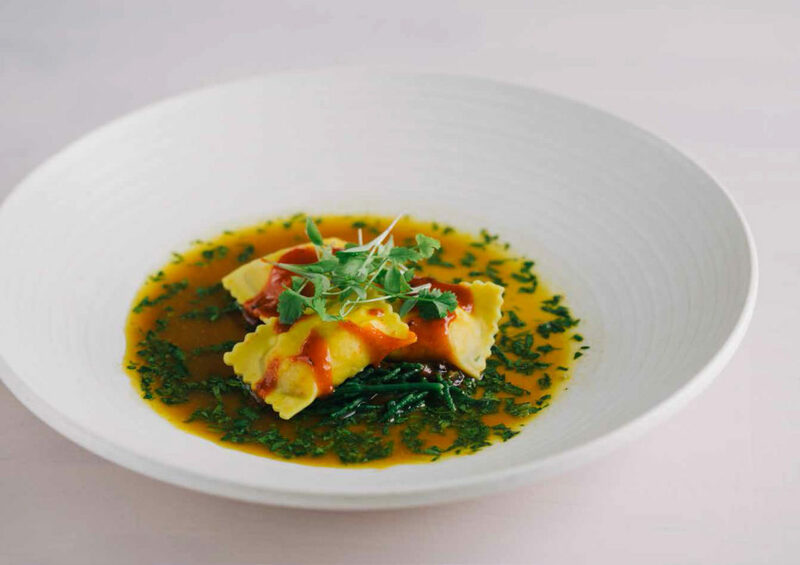 To make the ravioli, roll out the pasta dough into thin sheets using a pasta machine. Transfer to a lightly floured surface and cut out 12cm rounds with a pastry cutter. Place a ball of filling in the centre of half of the pasta rounds, then brush the edges with egg wash. Place another pasta round on top of each one and press the edges together to seal, stretching the dough slightly and moulding it around the filling with your fingers to make sure there are no air gaps. Use a pair of kitchen scissors to cut around the ravioli to neaten the edges. For the bisque, smash the lobster carcasses with the back of a pan to obtain small morsels. Sear them in a large saucepan, on a medium heat with a tablespoon of olive oil. Then add a couple of tablespoons of butter and roast the carcasses. Once the butter begins to foam, add the roughly chopped celery, shallot, spices and garlic clove. When the vegetables are tender, incorporate the diced tomatoes. Deglaze the pan with Cognac and add the fish stock; simmer for 25 minutes. Add mix to a blender & blitz. Strain, making sure you recuperate the maximum amount of bisque by pressing the carcasses. You might need to reduce the bisque a further 5 minutes to obtain the right consistency. Heat the red onion and chopped tomatoes in a large heavy-based saucepan over a low heat. Add the chillies, ginger, star anise, vinegar and sugar. Bring the mixture to the boil, then simmer for about 30 minutes, or until very thick and you can draw a wooden spoon across the base of the pan so that it leaves a channel behind it that does not immediately fill with liquid. Add the fish sauce and cook for 2-3 more minutes. To serve, warm the bisque and cook a little spinach. Blanch the ravioli for 7 minutes in boiling water. Put the spinach in a bowl place the ravioli on top, nap it with the bisque and put a teaspoon of the jam on top.